Tripp Lite DVI - HDMI (High Definition Multimedia Interface) cable allows interconnection between digital displays devices, such as DTV's (Digital Television), Plasma displays, LCD TV's, and projectors, to digital source devices, such as digital set-top boxes, DVD/DVD-R players, and AV receivers. HDMI DTV's will display video received from existing DVI-equipped products, and DVI-equipped TVs will display video from HDMI sources. HDMI technology uses a much more compact and user-friendly connector than the existing DVI connector. The HDMI specification handles higher-bandwidth, uncompressed video and multi-channel digital audio, all in one neat cable solution. Don’t settle for less than the best—enjoy the ultimate in true digital video quality! 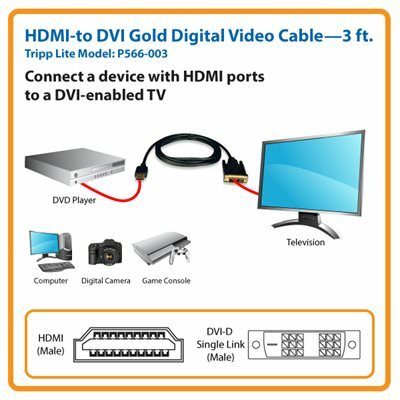 Tripp Lite’s P566-003 3-ft. HDMI-to-DVI Gold Digital Video Cable connects DVI-enabled HDTV display devices such as DTVs, plasma displays, LCD TVs and projectors to HDMI-enabled digital video sources such as digital set-top boxes, DVD/DVD-R players and AV receivers. Unlike cut-price cables, the P566-003 is manufactured to exacting specifications, using superior materials, for a difference you can clearly see. And we back our pledge of quality with a lifetime product warranty. The P566-003 DVI-to-HDMI Gold Digital Video Cable creates a pure digital connection between DVI-enabled HDTV devices and HDMI-enabled digital video sources. It features a 5 Gbps bandwidth capacity, 24K gold connectors for optimal signal transfer. Premium double shielding ensures a consistent, clean video signal and impedance-matched twisted pair construction with premium double shielding reduces cross-talk and interference. A flexible PVC jacket construction makes the P566-003 easy to install, even in tight corners and other areas where space is restricted. When you choose this genuine Tripp Lite cable, you get superior performance plus peace of mind! We’re so confident of the quality of the P566-003 that we warrant it to be free from defects in material and workmanship—for life! Additionally, the P566-003 is manufactured in compliance with strict RoHS specifications, reflecting Tripp Lite’s commitment to environmental responsibility.